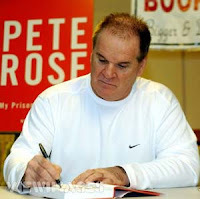 All-Time hit leader Pete Rose says free agent slugger Barry Bonds should be considered innocent of crimes until proven guilty and thus should not be prevented from playing baseball, but it would be pointless for the Yankees to sign him. "He could play, but is he going to be effective?" asked Rose during a storefront autograph session coinciding with National Hall of Fame induction week in Cooperstown. "...I don't care what any body says, you need spring training and he's let it go on too long. When I played I needed two weeks just to get callouses on my hands." Bonds is preparing to defend himself a federal indictment charging him with purjury and obstruction of justice for allegedly lying to a grand jury about performance enhancing drugs. Rose is seeking reinstatement to the major leagues after being banned for betting on the game, and has formerly served time for income tax discrepancies. The three-time batting champ and all-time record holder with 4256 hits questioned whether Bonds would even have a position to play with the Yankees, and doubted whether the longtime National League veteran could make a dramatic switch to the American League as a designated hitter. "It's a pinch hitter. That's what it is. You're asked to pinch hit four times in a single game, and that (kind of hitter) is a difficult breed," Rose said in an exclusive interview with MLBnewsonline. Rose, 67 -- wearing a beige ostrich skin hat with matching cowboy boots -- scoffed at Bonds' agent Jeff Borris' claims that his 44-year-old client would be ready to face major league hitters in 10 days. "You just can't get ready that fast, as good as he is, at that age," Rose said. Bonds has been the subject of speculation that he would sign with the Yankees, a rumor underscored by a recent MLBnewsonline report from a confidential clubhouse source that the team had drafted a proposed contract which would be offered to Bonds once injured right fielder Hideki Matsui is declared out for the season. Matsui is continuing to try to make a comeback and has put off season ending knee surgery. Co-Chairman Hank Steinbrenner has since acknowledged that the Yankees front office has discussed signing Bonds. However, cryptic comments by General Manager Brian Cashman have been interpreted in some quarters as indicative that the proposition to sign Bonds is no longer on the table. Rose considers Bonds one of the top five all-time greatest players along with Babe Ruth, Ty Cobb, Willie Mays and Hank Aaron, but contends he would be a superfluous addition to the Yankees as the team is playing well enough without him. "You don't fix what ain't broke."